Power, Efficiency, and Bandwidth. Werlatone provides all three qualities in its growing line of High Power 2-Way Combiners/Dividers. Model D9869 is no exception. Covering a frequency band of 800-3000 MHz, the D9869 has an average power rating of 400 W CW, and operates with an insertion loss less than 0.4 dB. Measuring just 3.7 x 1.9 x 1.07", the D9869 is ideal for all military and commercial environments. Power, Efficiency, and Bandwidth. Werlatone provides all three qualities in its growing line of High Power 2-Way Combiners/Dividers. Model D9869 is no exception. 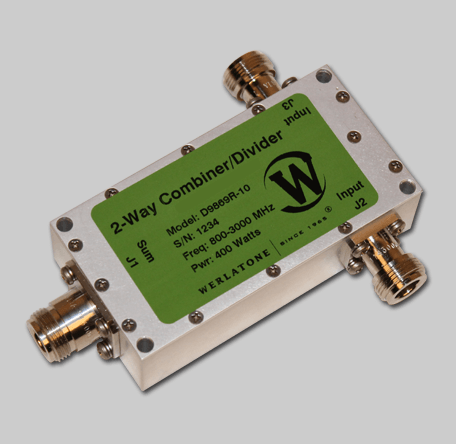 Covering a frequency band of 800-3000 MHz, the D9869 has an average power rating of 400 W CW, and operates with an insertion loss less than 0.4 dB. Measuring just 3.7 x 1.9 x 1.07″, the D9869 is ideal for all military and commercial environments.